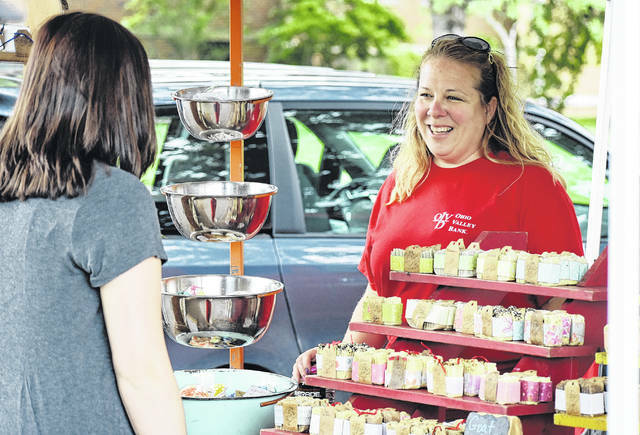 Raised Around Rio market organizer and vendor Jennifer Littlejohn (right) greets a patron at her booth at the village’s farmer’s market on Wednesday. The village farm, craft and artisan market of Rio Grande continuing every Wednesday from 4 to 7 p.m. until Sept. 26 in Rio Grande, Ohio. RIO GRANDE — Raised Around Rio has blossomed into its third year as the village farm, craft and artisan market of Rio Grande continuing every Wednesday from 4 to 7 p.m. until Sept. 26. According to market organizer Jennifer Littlejohn, the market will also feature a special added event this season, in conjunction with the Bob Evans Farm Festival, from 8 a.m. until noon on Oct. 13. Since its inception in 2016, the market has grown from roughly eight vendors to over twice that number in a span of just three summers. Currently, produce is not as available as other items, said Littlejohn, but as vendors are able to harvest, produce will appear. An assortment of crafted items are currently available along with food products such as cheese, bread, jams and jellies. Littlejohn, a crafter of soaps, salves and lotions, has been practicing her art for the last five years. She grows her own herbs and infuses her concoctions with herbs and locally produced goat milk. According to Rio Grande Mayor Matt Easter, the event is not only a setting to showcase the wares of community members but a place of community fellowship and interaction. The market is held near the Ohio Valley Bank extension office, pinched between the North College Avenue intersection with West College and North Atwood streets in Rio Grande. For more information or questions about how to join, look for the Raised Around Rio Facebook page.